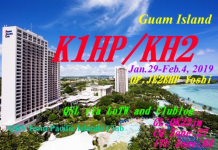 Howard, WQ6B will be active from Guam as KH2/WQ6B during July 20-24, 2018. QRV on HF; SSB & FT8. QSL via H/c, LoTW.